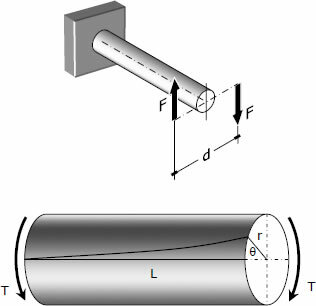 Consider a bar to be rigidly attached at one end and twisted at the other end by a torque or twisting moment T equivalent to F × d, which is applied perpendicular to the axis of the bar, as shown in the figure. Such a bar is said to be in torsion. where J is the polar moment of inertia of the section and r is the outer radius. where T is the torque in N·mm, L is the length of shaft in mm, G is shear modulus in MPa, J is the polar moment of inertia in mm4, D and d are diameter in mm, and r is the radius in mm. where T is the torque in N·m, f is the number of revolutions per second, and P is the power in watts.